The weather has finally cooled from its roiling boil. And with this lowered temperature comes the more hallowed weeks of the year aka sweater weather. If you live under a rock, then I pity you. It’s dirty under there. And you don’t know about sweater weather. Sweater weather, as defined by the Dictionary of Me, is “weather where it is appropriate to look chic in knitwear without the fear of being either too hot or too cold”. It’s not hard to look good in sweaters. With so many different styles (baggy, structured, slim-fit) and so many textures (cable-knit, silky-smooth, rough-knit), you can find a sweater that fits your exact specifications. When I was looking over my shockingly meager supply of sweaters, I decided I needed to make a conscious effort to add some more knit into my life. I got sloppy and devoted too much money to adorable crew-neck sweatshirts. But I do have a few gems amidst rough stones. I’m a sucker for oversized things, so my sweaters favor grandfatherly and hipster, in shades of burgundy to egg-cream. Some of my sweaters, the higher-end ones, are gifts — as if I can afford anything from Men’s Wearhouse — but the majority are things I’ve bought from regular clothing stores. For really nice quality, I would obviously recommend something of Men’s Wearhouse or Joseph A. Bank. But let’s face it, no one our age has that kind of money. So I’m here to offer up some more reasonable alternatives. 1. 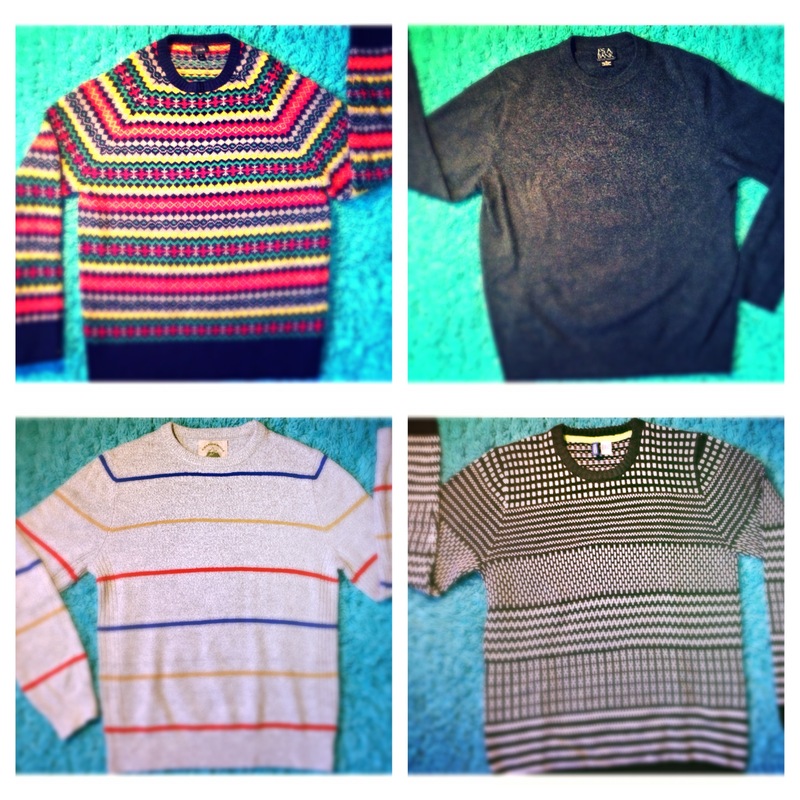 H&M: Although the quality can be hit or miss, I find that H&M has some great sweaters. The store on Newbury has several thick, interesting-patterned sweaters for twenty dollars a pop: Not a bad deal. 2. Uniqlo: Now, I don’t know how widespread Uniqlo is, but I know that there are several in New York. Uniqlo has some amazing pieces, like slim-fit button-downs in florals and spots. It also boasts a bajillion — real number? Nope — sweaters, ranging from $90 cashmere sweaters to $20 lambswool. The Uniqlo sweaters are perfect for simpler tops; they don’t have crazy patterns, but you can get V-necks, crew-necks, cable-knit, and cardigans in a variety of colors. 3. J. Crew: I can never decide if I love J. Crew or hate J. Crew. On one hand, it has great quality and chic style, but on the other hand, it can be pricey and sometimes I feel like the men’s clothes just stay the same, over and over, throughout the seasons. However, if you do a little bit of hunting during the sales, you can find some amazingly soft and cute sweaters. If you’re either too lazy or too far away to get to these stores, fear not. J. Crew has had an alive and well online store for some time now, and Uniqlo and H&M recently opened online branches of their own stores. So go out and enjoy some sweater weather. Make sure you drink lots of tea and slap on a few hats while you’re at it.